Area 6-DK is the ninth course of Cosmic Adventure and the fifty-fourth course overall in Mario vs. Donkey Kong: Mini-Land Mayhem!. It is a boss fight against Donkey Kong. The level is an arrangement of several Magnet Blocks and Blockers that can be drawn to reach certain Girders, with some Magnet Sparkies patrolling the area. Donkey Kong may occasionally hit a switch, disabling some Blockers while re-enabling others. 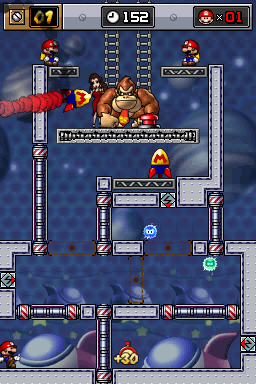 The Mini Marios must climb the Ladders in order to ignite each rocket, damaging Donkey Kong. The M-Token is located near the bottom right, just to the left of the rightmost Magnet Sparky generator. In Plus Mode, it is located closer to the very center, near the bottom center Magnet Sparky generator. The Mini Mario Card is located near the bottom left, just above a Magnet Rod. In Plus Mode, it is located near the top left, below an inverted Spike Trap to the right of a Magnet Rod. There is no specific order of Minis in Plus Mode. Spike Traps are also added. This page was last edited on March 20, 2018, at 16:06.